Between Memento, Inception, and Interstellar, Christopher Nolan has solidified his place as one of the 21st century’s preeminent storytellers. He revolutionized the superhero genre with The Dark Knight trilogy and also stands out as the sixth highest-grossing director in cinematic history. So what does this guy have to do to win an Oscar already? Heck, what does he have to do just to score a Best Director nomination? Dunkirk could very well be the answer to both of those questions. If any other filmmaker had helmed Dunkirk, it would likely be regarded as their magnum opus. Since Nolan has set the bar increasingly high, however, it’s hard to say where exactly this movie would rank in his filmography. That being said, three things are for certain. First, this is easily among Nolan’s most triumphant feats behind the camera. Second, it warrants comparison to the most engaging war pictures ever made. Third, Dunkirk is currently the best picture of the year and it could quite possibly hold onto that title well into awards season. 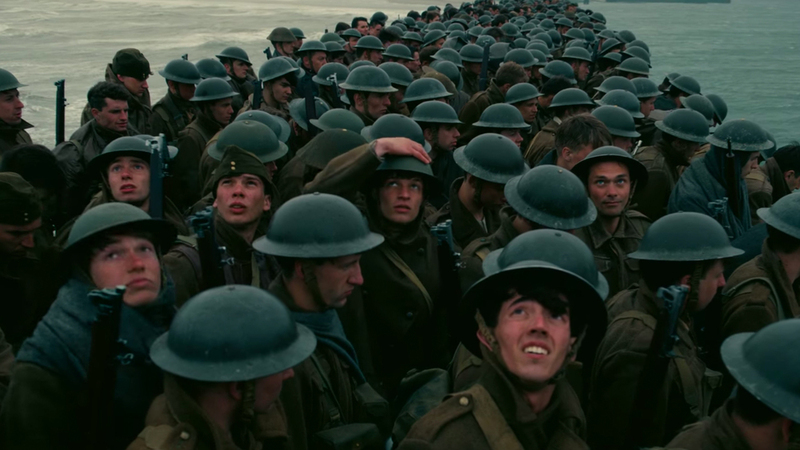 Throwing the audience right into World War II, Nolan tackles the Dunkirk evacuation from three perspectives. Out at sea are a mariner named Dawnson (Mark Rylance), his son Peter (Tom Glynn-Carney), and young George (Barry Keoghan). Although it seems like a fool’s errand, these humble sailors take off on a boat to rescue as many stranded souls as possible, including Cillian Murphy as a soldier suffering from PTSD. Up in the air is Tom Hardy as Farrier, a Royal Air Force pilot determined to keep the German Army at bay. On land are thousands of men waiting to either be rescued or die in the line of duty. All the while, Kenneth Branagh’s Commander Bolton does everything he can to wear a brave face as all hell breaks loose. While the whole ensemble is phenomenal, the MVP is surprisingly singer Harry Styles as a British private named Alex. Many were skeptical when it was announced that Styles would make his big screen acting debut in Dunkirk. Similar to Heath Ledger’s portrayal as the Joker, though, Nolan saw something nobody else did. Styles turns in a raw and powerful performance as a young man fighting for his survival around every corner while still maintaining his humanity. Believe it or not, Nolan wasn’t even aware of Styles’ teen heartthrob status when he cast him in the role. Christopher Nolan pictures are known for their complex plots and exposition-heavy screenplays. In Dunkirk, however, Nolan wisely decides to show rather than tell. It would’ve been easy for him to throw in a monologue about the cost of war or a backstory that explains one character’s motivation. Sometimes actions speak louder than words, though, and Dunkirk gets an enormous amount of emotion across with minimal dialog. You can look at any character at any point in this film and know exactly what’s going through their head. A brief glance two characters share can say so much more than a lengthy speech. On that basis, this is perhaps Nolan’s finest ensemble piece, as well as his most visually impressive picture. Speaking of visuals, Dunkirk is a masterfully crafted picture, utilizing state-of-the-art practical effects and nearly 6,000 extras. Hoyte van Hoytema’s immersive cinematography, Hans Zimmer’s heart-pounding musical score, and Lee Smith’s sharp editing creates a constant state of panic. The audience literally feels as if they’re on the beaches of Dunkirk in the midst of combat, especially when watching on the all-encompassing IMAX screen. The experience on the whole is like the Omaha Beach sequence from Saving Private Ryan, but stretched out to a feature length runtime. It’s intense and nerve-wracking, rarely giving us a moment to breathe, but we still want to see these people overcome all the obstacles. 2017 has been a strong year for war pictures, what with Wonder Woman and the third Planet of the Apes installment. The Dunkirk evacuation was even explored in the comedy, Their Finest. Where those films were all grounded in fiction, however, Dunkirk is grounded in brutal reality. The film not only makes for a fascinating history lesson, but also contains a meaningful message relevant to modern society. In an age of Trump’s America and Brexit, the nations of the world can feel more divided than ever. At Dunkirk, though, people united to help the British, Belgian, Canadian, and French alike. Nolan has ultimately made an inspiring picture that encourages us to help our fellow man, regardless of where they’re from. At the end of the day, every soldier at Dunkirk was simply trying to survive, making all of them equal. This entry was posted in Reviews and tagged Action, Drama, History on July 18, 2017 by Nick Spake.